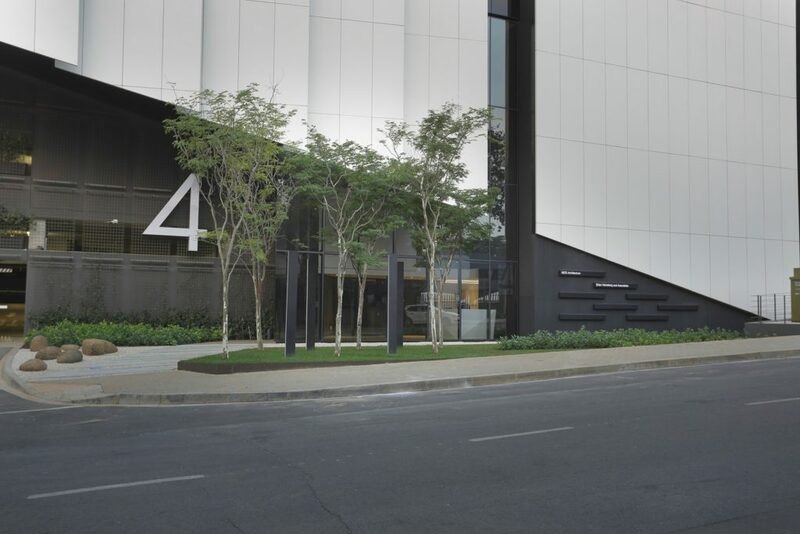 Number 4 Stan Road is a slick, sculptural eight-storey intervention in the heart of Sandton. 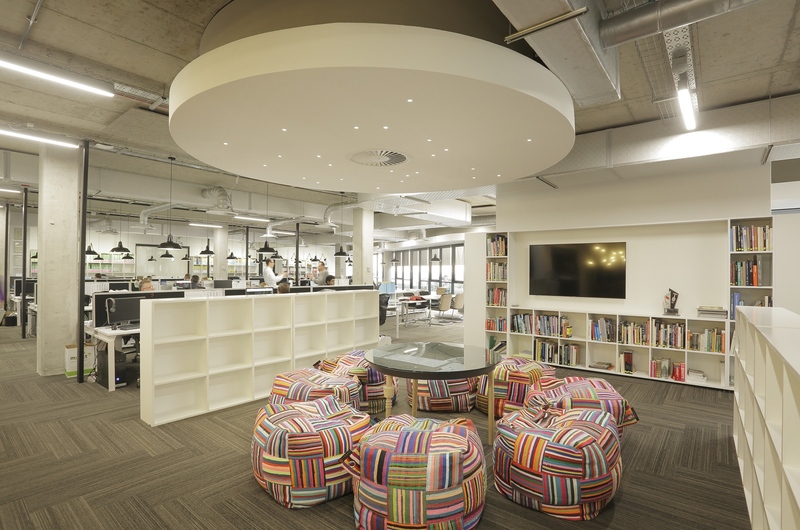 The development boasts both 4-Star Green Star SA Design and As-Built certifications from the Green Building Council of South Africa (GBCSA). Green building consultants Solid Green undertook the Green Star certification process, which recently won the project the Best Quality Submission category at the Green Star SA Leadership Awards – a platform that seeks to recognise and commend market leaders on the transformation of the South African property market. 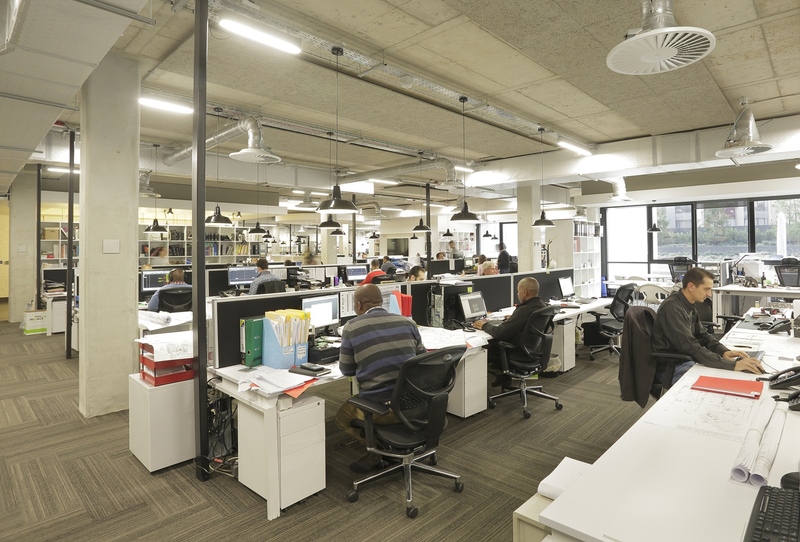 MDS Architecture designed the office building for consortium of professionals Sharmane Investments (Pty) Ltd made up of some of the partners in the practice, as well as those of their long-standing office neighbours Brian Heineberg & Associates. 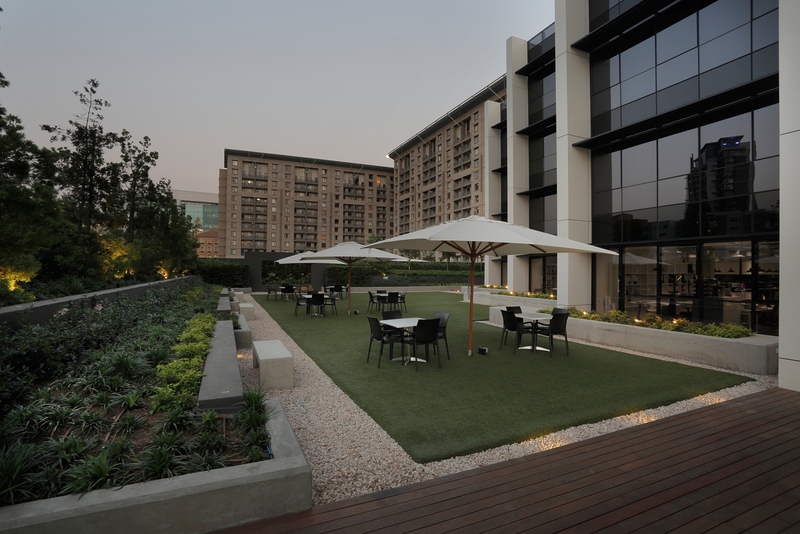 The project’s context was an important consideration in developing the design; it is bordered by residential towers on three sides, with a large office development between the site and the very busy Grayston Drive. The original single-storey building, constructed in 1991, was thus dwarfed by massive developments and could no longer accommodate the growing needs of its occupants. 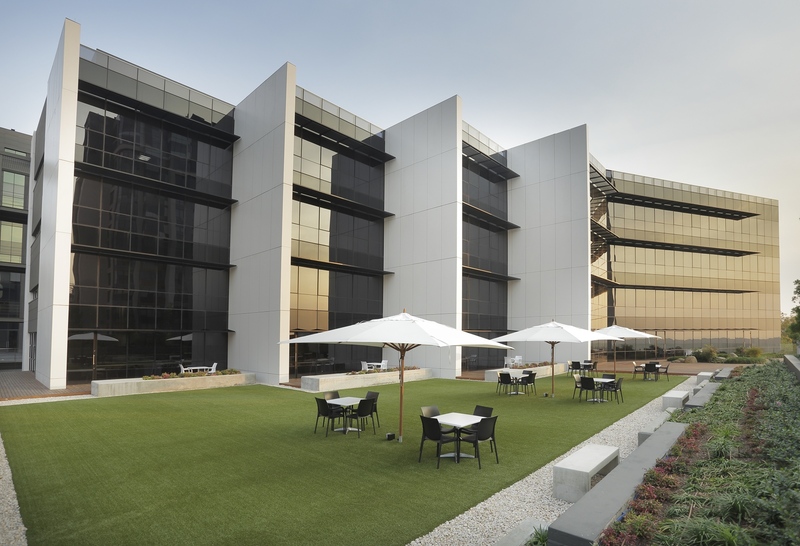 4 Stan Road is centrally located close to Gautrain bus routes which can quickly link employees to the nearby Sandton Gautrain station. Cyclist facilities, including 23 secure bicycle storage spaces, showers, change rooms and lockers are provided in the building to allow building users to cycle or even run to work. Architecturally, the building has two distinct aspects. The street façade on Stan Road is west-facing and is treated as a solid face with massive full-height fins behind which thin slivers of glazing peep southwards over the roofscapes of Sandton. In this way the design manages the typical heat build-up of a west-facing façade and controls the associated glare issues. The north-facing façade is fully glazed, opening up the office spaces to views across Bryanston towards the Magaliesberg – with external views provided for over 80% of the usable floor area. Shading screens along the northern façade, together with the glazing type and glazing ratio, ensure that adequate levels of thermal comfort were met while respecting budget constraints and aesthetic requirements. Parking is provided in excess of the minimum statutory requirement for offices, and is accommodated in a podium structure with a generous landscaped sky deck onto which the offices open. All parking areas are thus above ground and naturally ventilated and illuminated. The top of the parking podium forms a landscaped break-away exterior deck for the building’s users, with large-scale indigenous trees. The podium itself is clad with recycled security grilles from the original building, which have been fitted with planters at each floor level in order to eventually create a ‘green wall’. The choice of materials further contributes to occupant wellness in that paints, adhesives, sealants and carpets all have volatile organic compound (VOC) limits that fall within the Green Star allowance. Carbon emissions have also been reduced through the use of more than 60% total recycled content of all steel used in the project; a reduction in the absolute quantity of Portland cement by over 30% across all concrete mixes used during construction; and by reducing the use of PVC by more than 30% on the project through the use of alternative products. Energy efficient lighting is used throughout the building; and two efficient air cooled chillers are used with two Variable Air Volume (VAV) air handling units per floor to provide efficient cooling of the building. In terms of indoor environmental quality (IEQ), fresh air is provided at over 12.5 l/s/person which results in a high level of fresh air far exceeding the SANS standard of 7.5l/s/person. Water efficient sanitary fittings have been used to reduce the predicted potable water consumption. This is done by limiting wash hand basin flow rate to 5l/min, and urinals to 0.9l/flush. Toilets have dual flush mechanisms, and shower heads have a 9 l/min flow rate. Limited landscaping has been provided, further decreasing the demand for potable water used for irrigation. Sub-metering of both water and energy is provided for. These are connected to an automated system which will enable easier collecting, monitoring and recording of data as well as alert to irregular trends in consumption. Building tuning post-occupancy is a contractual requirement between the building owner and the various consultants and contractors (electrical, mechanical, irrigation, lifts), and this process is currently underway. In terms of waste management, an adequately sized waste recycling area is provided that is safe and easily accessible for recycling and waste collection. Tenants are encouraged to separate waste and recycling material into separate bins, and a service provider then removes the recycling material for separation off site. 4 Stan Road has succeeded in bringing together green building and urban renewal considerations with quality architectural design, in a project that both respects its context and looks forward to a more sustainable future.